Tuesday. 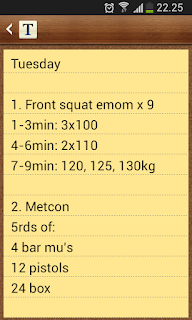 Front squat emom x 9min (up to 130kg). 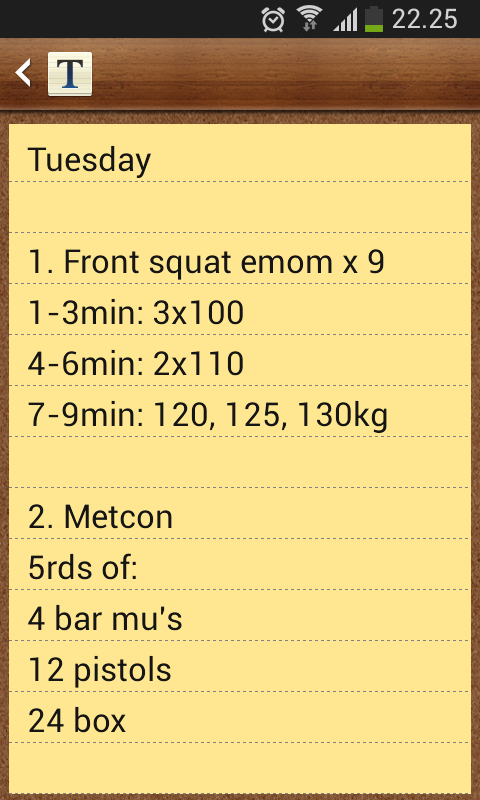 Metcon, 5rds of: 4 bar mu's, 12 pistols, 24 box. Time, 12.28. Time to put legs to work. It feels like an eternity since squatting for real the last time. Okay, it was last week's Thursday so there is a seed of truth in there. It's unforgivable not to squat for a week. However, there were some issues with this body so I'll forgive myself this time. I had written hero workout Klepto as one option and another one was a row / lunges kind of combo to kill legs but it turned out to be different kind of lower body smash in the end. It felt good to do front squats after doing much more back squats for strength lately. Front squats have been there mostly in the form of squat cleans or then in metcons with lighter weights. So hitting it heavier was awesome. I knew there isn't plenty of time to be spent at the gym so I had to do it emom style if I wanted to have time for a good metcon. For the first weight I did touch'n'go style not stopping on the top. At 110kg I took one extra breath before going back down for the second rep. After having done doubles it was time for singles. Originally I thought about doing them at 120 kilos but then again it felt good so I decided to add some weight. Couple of singles up to 130kg. During the second round I started doubting the reasoning behind this one =) My legs were killing me big time! It was a good change of stimulus, hitting legs in 2/3 elements and then some muscle-ups between them. Haven't been doing pistol squats in a while so they felt more challenging, maybe because of the lack of them. Box jumps didn't make it any easier. Boxes are okay for me and I like them a lot. But the number of them was rather high and you combine it with pistol squats, and my legs were jello during the workout. And afterwards at home they felt like someone had hammered them for an hour. It's odd how quickly they got sore. I'm waiting eagerly how they feel like tomorrow. Muscle-ups were the rest period if I had to name one. Unbroken each round.